Simon Houpt and The Globe and Mail: Kit Kat spat goes viral despite Nestlé’s efforts. A global game of Whack-a-Mole broke out Wednesday on the Internet when YouTube removed a gruesome anti-Nestlé commercial by Greenpeace after the multinational food giant complained, only to have viewers flock to the video-sharing site Vimeo.com, where the spot became an instant cause célèbre because of the reputed censorship. 1. Direct link to vimeo video (including comments). 2. 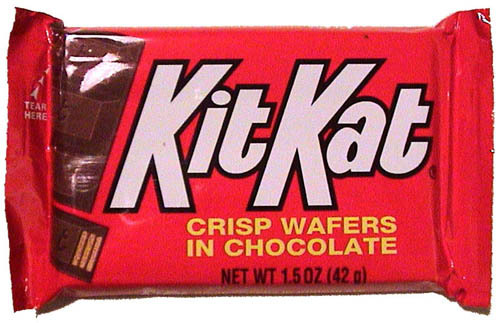 Related Vancouver Sun article, Coffee Crisp, Kit Kat pose threat to rainforests: Greenpeace. Franchisors have no idea what is in store for them. This ad appeared in today’s Toronto Star. 1. Contrary to the heading, you do not “buy” a franchise. You sink cash into this type of business opportunity and hope to achieve a salary and ROI over the life of your license of using the trademark using a promised “proven system”. 2. Small business is always a lot harder than you’d ever think. It takes years to develop the technical, management and decision making skills to be a success. Often the cash burn rate in franchising is so great that you never get to see profitable times: You simply flame out too early. 3. Your first contact with a trademark franchise system should never be at a trade show. You are at a very big disadvantage at a trade show: they control the atmosphere, appear much more successful than they actually are and give the false sense of being in a group of profitable businesses. Big Show costing Big Dough: National franchise associations such as the Canadian Franchise Association rely very heavily on the revenue that these shows deliver. These types of shows are ground-zero in the subtle and not-so subtle art of persuading mom and pop investors that the next franchise will make them a millionaire. In 1998, I showed up with a CBC television crew to the fall CFA show. We handed out pamphlets warning attendees, intercepted the minister as he was exiting from his franchisor rah-rah speech (the last time an Ontario minister showed up, I think) and barged our way into the trade show to get some grip-and-grin footage with thinly smiling salespeople. The CFA and their supporters were not amused. Everyone pays a lot of money to bamboozle the next chump. They certainly don’t need anyone coming to piss on their parade. Their carefully planned PR news puff piece, was turned inside out: Toronto viewers instead saw a be careful of the predators out there story instead. 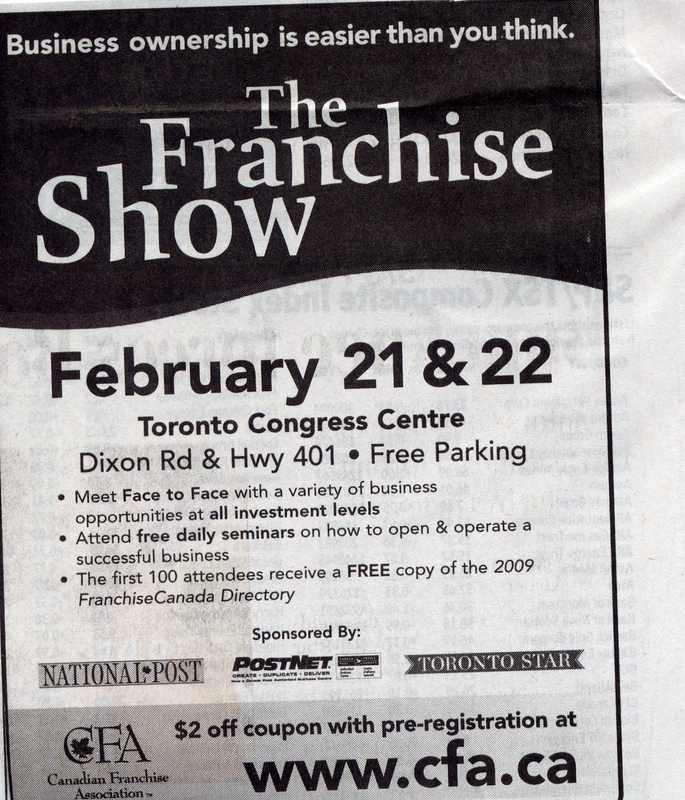 I guess it was predictable that Dan Farmer of the Royal Bank of Canada would insist that I never show up at another franchise trade show if I wanted financial support for the Canadian Alliance of Franchise Operators. I kept my word although I never saw $1 from any of the 5 banks that financially underlay all Canadian franchising. In 1998 we had to convince a television editor to assign a reporter, a videographer, record, edit and then air the results. Tough getting media attention because franchise fraud is pegged as a niche audience item. create and post YouTube video (I’ve already reserved a FranchiseFool channel, btw) that shows examples of how franchise salesmen openly lie at a trade show because the franchise agreements that give them a License to Lie, Cheat and Steal (kudos to Blue MauMau) from mom and pop investors. YouTube will become a very effective means of information sharing for franchise investors. This is the first general franchise message [ie. it’s not this brand or that brand that is acting in a predatory fashion] to hit YouTube. It reflects the reality that all franchise relationships have the same characteristics, the same tools or potential; everywhere, all around the world. What makes franchising different than independent business is its ability to ransom your life savings. This is done because, at the moment you sign, your investment instantly changes from 100% liquidity to next to zero [transforms into a sunk cost]. You imagine yourself in control but have lost 100% control of your assets. New franchisees come to realize quite quickly that they go along with the franchisor or they will be punished. Many franchisees kid themselves; hoping upon hope that their masters will allow them to exit by selling to the next sucker. That rarely happens because the franchisor makes more money the less you make at re-sale. Over years and after signing a confidentiality agreement, investors realize that it was always this way: the moment you signed, 90% of what they put in was always at the franchisor’s absolute use. The sunk cost nature is the source of a franchisor exercising their discretion in a one-sided manner (opportunism). The franchisee’s near total net worth is tied to the whims of a party that has next-to no penalties if they choose to act in a dictatorial manner. Soon I think we will have a franchising channel with dozens of trademark correspondents bringing back information that is not constrained by government decisions, coerced confidentiality provisions or SLAPPs. That is very good news for good systems and not so good for opportunistic ones. And this should be applauded by all stakeholders that want to improve quality, in what we perceive to be a free market economy. Thanks to the folks at BakersDelightLies.com for bringing this out.